I get a heap of promo specials advertising 7 nights accommodation in Whistler Blackcomb. Deals including ski lift pass look reasonably priced but seriously – it’s a long way to go from Australia for just a week… Isn’t it? 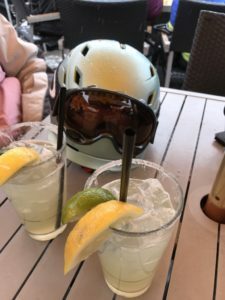 With a week’s leave pass, leaving eight children, two husbands and two extensive family schedules Sasha and I quickly found out Whistler Backcomb was JUST PERFECT for one week. You can watch three movies! You can read two magazines! You even feel quite relaxed! Sure, I love yoga, bushwalking and reading novels while swaying gently in a hammock but when you’ve never left your 3 year old longer than 2 nights it’s best to keep busy. 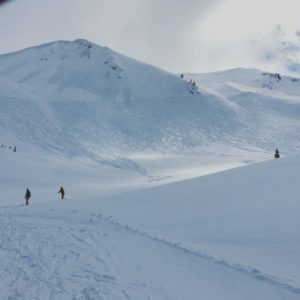 Whistler has 8000 acres of skiable terrain, including 16 snow filled bowls and opportunities to hike up and ski out into the great white snowy wilderness all within the resort boundary. Every ski resort worldwide has groomed runs, but Whistler has spectacular skiable vertical ‘paddocks’, more like moonscapes that beg to be explored. Admittedly, Japan has amazing powder skiing conditions but Whistler village is a pedestrian shopping mecca and dining extravaganza. So in preference to lying on a beach in Bali it was an easy choice. And less chance of catching Dengue fever. 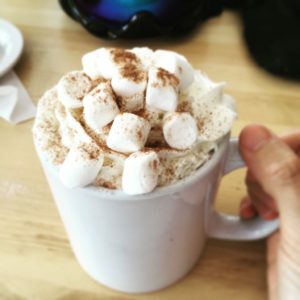 Loving powder skiing and tree skiing as I do, I researched my options and discovered Extremely Canadian, a family run business that operates Backcountry, snowboard and ski tours and courses. They advertise an action packed Steeps course with a unique twist. This is neither ski lesson nor ski guiding. 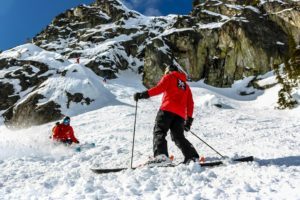 It’s two days of technical expertise aimed to improve powder skiing, tree skiing and black diamond skiing , often accompanied with precarious entry points such as chutes or cornices. 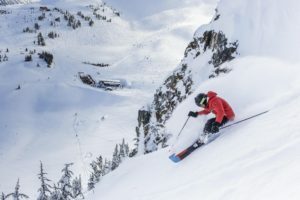 Extremely Canadian “teaching adventurous skiers to attack the steeps with more control and confidence” has operated for over 20 years in Whistler and promise that trees, chutes, couloirs and steeps will become second nature to participants. Sasha was extremely dubious in the lead up to the steeps course. 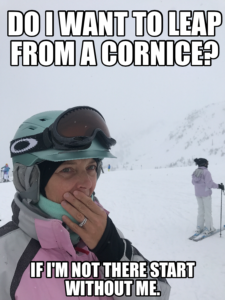 It was my idea and she was up for it, but when she saw brochure photos of young guys leaping with their skis crossed behind their back, jumping off cornices she freaked out, despite being a strong competent skier. I reassured her that this was 2017 service-oriented North America, nobody would make us leap off cliffs unless we felt like it , she spent a sleepless night the evening prior. Truth be told there was a good chance she was cursing me under her breath and fantasising about a girls shopping trip to Thailand instead. The two day Steeps Clinic turned out to be PERFECT for our skiing needs. The coaches learnt everyone’s names within two minutes and with staff ratio 1 instructor: three skiers the attention to our ski needs was fantastic. After warm up runs on groomers the instructors took us to a bumpy black run, we skied down one by one to be assessed according to ability. The coaches had a brilliant eye and had the skiers well-matched ability-wise. 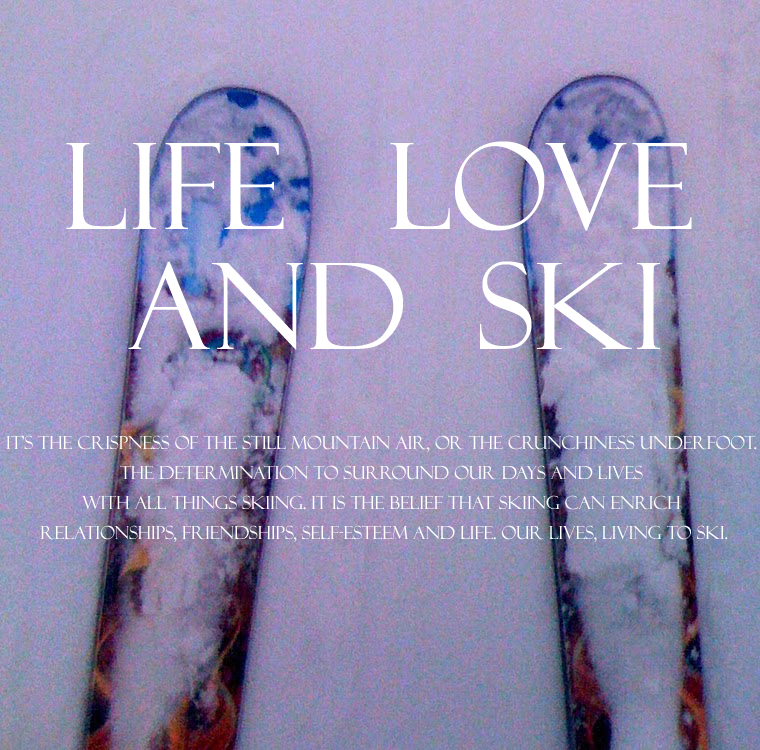 The young cornice leaping cowboys went one direction, the sensible law-abiding skiers went the other. However, just to prove that 60 really is the new 30 Sasha and I had 63 year old Greg in our group. He had more stamina than the two of us put together and took every steep entry and cornice at a leap – no kidding, John our instructor pointed out every spot to land it right. Day one our group skied safe crevasses, well-spaced trees and gorgeous steep bowls, our coach careful to point out best points of entry and tips to assist safe descent, particularly as visibility was poor (translation: difficult to see which direction was up or down due to fog). 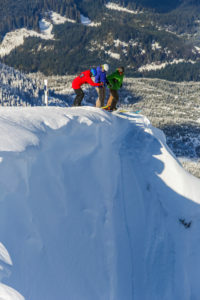 John knew all the nooks and crannies around Whistler mountain, when someone knows exactly where they’re going (not us!) you get so many more runs in, we skied right up to 3pm and our legs were burning like well-cooked chicken wings, which we enjoyed eating later on. Day two our group teamed up with the knowledgable Steve and his group. It added a fun element, the coaches did some video analysis and gave us feedback on hand and body position that would help us navigate the steeps. Again, half the day was poor visibility so we hit the trees so we had something green as a visual reference point. The coaches knew where the best tree skiing was, best entry points and safest routes so we avoided that whole ‘I’m lost and I can’t see a soul’ element that can happen when you go looking for adventure. At one point in the afternoon Steve divided the group and took three of us up Chainsaw Ridge, a precarious slope in poor visibility with a 3 metre jump onto steep incline. 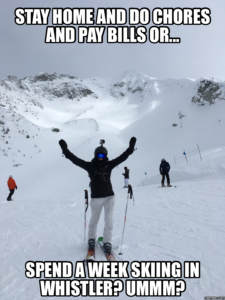 I’m used to my husband leading me off dodgy cliffs regularly when we ski so I followed like a obedient little lamb to the slaughter and had a blast. Steve explained the best entry strategy so we all felt safe, we met the others who skied an alternative route, equally as thrilling. We loved the Ruby bowl, a steeply incline bowl of powder with stunning alpine scenery. We spent these two days with the biggest grins on our faces and kept saying ‘this is amazing’. I just skied off that! Despite the course being two days in length (Monday, Tuesday) there is opportunity to add Wednesday as single day as well as Thursday/ Friday or Saturday/ Sunday as two day combo if you’re up for more action. After two very long and action-filled days our legs needed a break, we felt equipped with skills to ski these bowls and trees without the coaches (maybe not Chainsaw Ridge or Stefan’s Chute) for the rest of the week and were ready to sample Whistler’s finest apres activities after a few more days skiing. to Whistler to gaze romantically into each other’s eyes over candle light so we frequently headed to kale and quinoa salad meals and of course buffalo wings or nachos. Sasha might have been hesitant pre-Steeps course but at week’s end she’d ordered deep fried pickles, upgraded her skis to powder skis and dropped into Backcomb bowl and Ruby bowl after hiking up the hill like a local. Take us out of this town, I’m afraid what we’ll try next! There was talk of wanting to follow Greg off a jump. Serious talk. 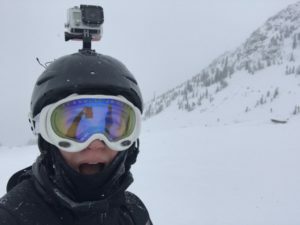 Speaking of the Steeps course, Sasha loved that it was all about how to approach the ski slope and entry points rather than a normal ski lesson. “They teach you how to tackle the slope you are faced with, you feel 100% safe and 100% looked after”. Coach John sums up “if you want to stay on the groomed runs get a lesson, Extremely Canadian tends to attract the more adventurous skiers”. 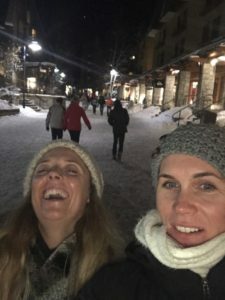 If it’s just 7 nights in Whistler you can do because your kids will miss you and your home life is too busy I totally recommend coming, you’ll find it is ‘just long enough’ without loved ones. 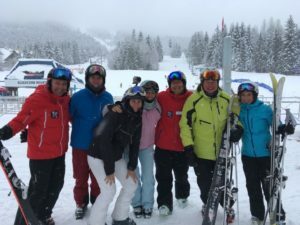 Extremely Canadian runs tours and clinics in Argentina, France, Switzerland, India, Japan, Italy and Spain and has customised Steeps Clinic and other customised trips (up to 5 similar ability skiers with your choice of coach). I’d better raid the kids’ bank accounts for these trips, I spent all my money on buffalo wings and margueritas. ONE MONTH IN THE SNOOOOOOOWWWW……..